SUMMER BREAK PRESENTS a vital opportunity to relax, travel and spend time with friends and family. Yet a growing body of research suggests that kids should also devote time to honing their math skills over the summer. A 2014 study released by the RAND Corporation concluded that students attending summer learning programs returned to school in the fall with an advantage in math. Many parents intuitively know that their kids should be practicing math over the summer, but are daunted by the task of adding math enrichment to their schedule or are unsure how best to practice math skills during a vacation without compromising family time and causing discord within the family. Involve your child in cooking. Kids can learn about fractions while helping you measure out food quantities, bake pies or double or halve recipes at summer night barbeques. Play cards. The classic game of “war” in cards can be adapted to teach computation. Parents and kids can each be dealt a pair of cards and then be asked to provide their product, sum or difference. Fill your house with analog clocks, not digital ones. Analog clocks can be used to teach pattern recognition and even early multiplication skills. Challenge your child to track time on an analog watch if they leave the house for a bike ride or play-date with a friend. Use cash. 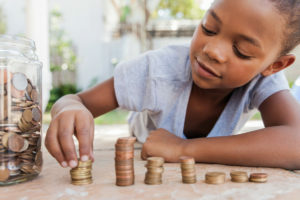 Allow your kids to physically handle cash for petty purchases, especially if it is money they earned from chores or allowance. Capitalize on teachable moments, such as asking them how much change you should get from purchasing that ice cream cone. Go on a walk and collect leaves, seeds and anything else that catches your kid’s eye. You can then make a graph of what you collected together. Watch sports. By watching baseball, for example, your kids can learn batting averages, winning percentages and team or player statistics. Going on a summer vacation? Let the kids help create a budget for your plans to help them understand how much certain activities cost. Parents who want their students to maintain or build on their math skills over the summer often choose the support of a learning center. One of the important factors to consider is whether the center offers highly flexible, customized programs that adapt to both students who are catching up or already far ahead.